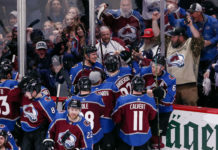 The Colorado Avalanche will head into Thanksgiving firmly in a playoff spot, something that has been proven to be very important in years past. 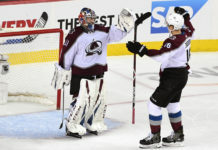 The Avs went into Los Angeles and thumped the last-place Kings, 7-3 keeping them firmly in the Western Conference’s top eight teams. The power play ignited the Avs, accounting for three of the Avs’ goals, and all of them coming on pretty passing plays. With 26 points, the Avs hold the first Wild Card spot in the Western Conference — and since 2005-06, more than 75 percent of teams that hold a playoff spot on Thanksgiving end up making the playoffs at the end of the year. The power play got off to an early start. A little over 11 minutes into the game, the second power play unit got their chance, and a quick passing play between Alex Kerfoot, Carl Soderberg, and Vladislav Kamenev ended with Kamenev scoring into a wide-open cage. It was his second of the season, and a nice payoff for someone who has been getting better each game. 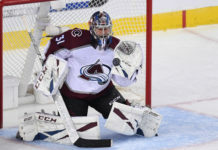 Soon after, Semyon Varlamov would misplay a dump-in, allowing Kyle Clifford to score an easy tap in to tie the game, but from that point on, it was all Avs. Nathan MacKinnon would add another power-play goal just seconds after winning a face-off in the offensive zone, and the Avs would head to the first intermission with the lead. After some penalty trouble in the second period, the Avs would get a nice gift when a Patrik Nemeth floater from the point snuck through to give the Avs a two goal lead. 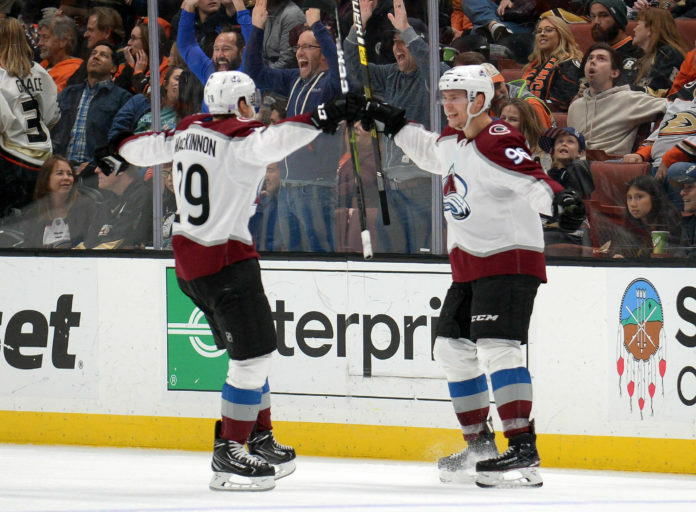 Colin Wilson would score another power-play goal for the Avs soon after, off a ridiculous pass from Mikko Rantanen, and the Avs took a three-goal lead into the third period. The Avs didn’t try to sit back in the third period against a bad Kings team. Just over a minute into the third, Tyson Barrie snuck in from the point to score an easy rebound goal to extend the lead. Just a few minutes later, Nikita Zadorov joined in on the fun, walking in from the point and scoring a bomb, glove side, to make it 6-1. Matt Calvert would tip in a Tyson Barrie shot to make it 7-1 just a little later to finish off the night for the Avs’ goal scorers. The Kings would add a few late goals, but the game was over after the second period. The Avs now head to Arizona on Friday to take on the Coyotes, before heading home the night after to take on the Stars at home.